OS (GIS) AIB, May 2006. Formerly entered as Bank (Earthwork) at cited location NS 319 312.. 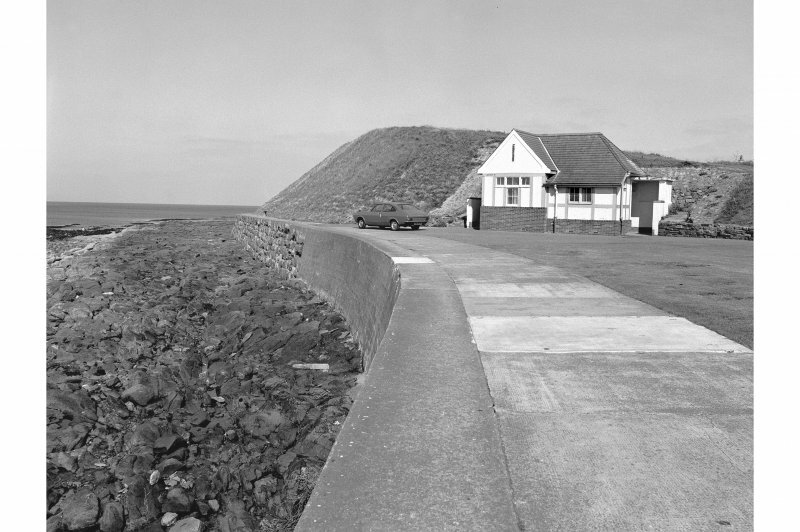 Designed to shield the town from the prevailing winds, the 'Ballast Bank' was constructed from the earth and shingle ballasts of sailing colliers. The ballast bank at Troon Harbour (NS33SW 23.00) is a notable and impressive feature, which must be considered a major element of the harbour development and associated housing, to which it affords protection from the prevailing winds and seas (in the SW). Founded on natural sandstone slabs, it has been grassed-over and strengthened with stone and concrete on the seaward (SW) side, where a low sea-wall provides a footpath along the base. It stands an estimated 10m high to a level top, upon which has been set an aircraft navigation beacon and a viewpoint indicator. Visited by RCAHMS (RJCM), 29 May 2006. The available map evidence indicates that this feature extends from NS c. 30746 31270 to NS c. 30745 31239 to NS c. 31165 30872 to NS c. 31238 30867, a total distance of just over 650m. Both ends are ramped, and curve towards the NE. Information from RCAHMS (RJCM), 31 May 2006.